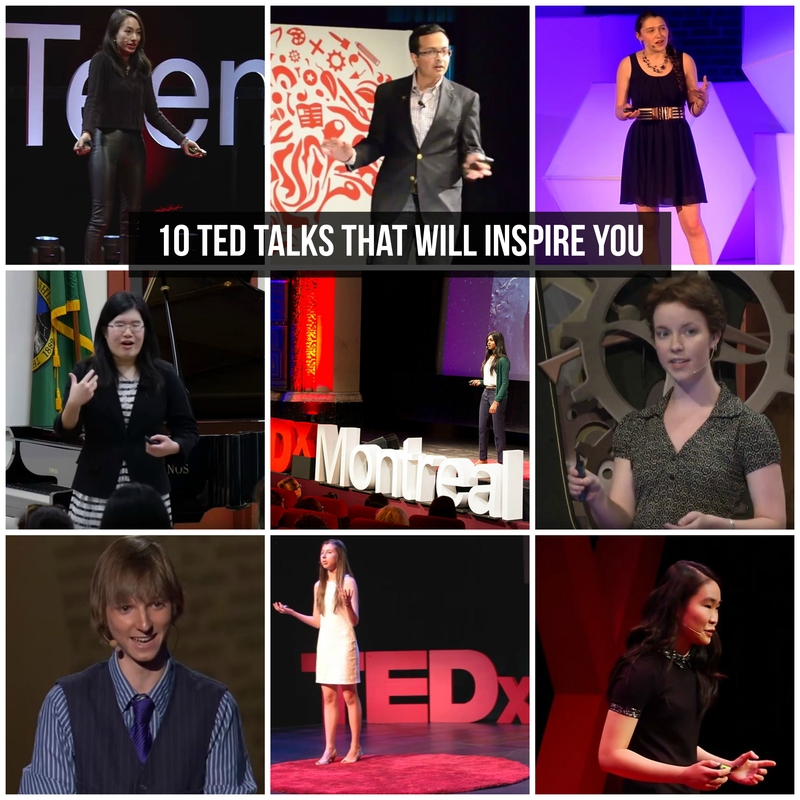 Looking for some TED talks to watch during these dog days of summer? Check out the list below from some of our amazing alumni — who are true champions of science. In the line-up below, our alumni share their thoughts on everything from how to fuel a mission to Mars to designing a more efficient solar cell. Nivatha, an Intel ISEF 2014 finalist, shared her research on using oil-eating microbes to clean oil spills at TEDxMontrealWomen in 2015. Current oil spill cleanup methods, including dispersants, harm the environment and marine life. But certain microbes can break down and disperse hydrocarbons, which form the basis of all oils. "If you're interested in the STEM fields or even just want to try it out, just go for it! Science is so diverse, there's bound to be something that interests you," she says. Paige, the Regeneron STS 2016 first place winner and Intel ISEF 2015-2016 finalist, spoke at TEDxDirigo in 2016. Paige developed a cost-effective solution to remove phosphorous from water sources, after studying the streams in her hometown of Bangor, Maine for years. The spaghetti-looking filter, a derivative of algae, helps clean up phosphorous pollution in water and reduces algae. Paige was awarded Maine's Stockholm Junior Water Prize in 2015 and studies chemical engineering at Stanford University. Erika, the Intel STS 2010 first place winner and Intel ISEF 2007-2010 finalist, spoke at the TED Institute in 2013 about how to get humans to Mars. She shared theories on how to fuel a spacecraft to and from the Red Planet for a manned mission. One way to solve the compounding fuel problem — where a ship needs more fuel to return than take off — is using the energy from other planets for gravity-assists, called the Interplanetary Transit network. Valerie, a Broadcom MASTERS 2011 finalist, Intel ISEF 2012-2015 finalist, and Intel STS 2015 finalist, spoke at TEDxYouth@Redmond in 2016. Valerie uses quantum physics to improve solar cells. She researches more efficient power generation with quantum dot solar cells, a type of solar cell that uses quantum dots as photovoltaic material instead of bulky materials like silicon. Valerie was also a 2014 Davidson Fellow and was invited to participate in the second White House Science Fair. "It was hard for me at times to understand that I could be capable of these moonshots, these world-changing ideas," she says. Ann, an Intel ISEF 2014 and 2015 finalist, spoke at TEDxTeen in 2016 about her inventions. She started creating her own toys as a child, and now she's invented the Hollow Flashlight and eDrink phone charger that turn excess heat into energy. Ann was inspired to invent a different electricity source when a friend failed a grade in school because her family couldn't afford electricity and she couldn't study in the dark. Her inventions offer alternative, sustainable sources of energy. Ann appeared on the Tonight Show with Jimmy Fallon and was named one of Times' 30 Under 30. Arjun, an Intel ISEF 2013 finalist, spoke at TEDxEdmonton in 2014. When a family member was diagnosed with cancer, Arjun decided at 14 to study the disease. He analyzes mathematical models and evaluates potential cancer therapeutics. Arjun's research and models have found potential ways to destroy cancer cells' defense mechanisms. Arjun believes youth science leaders are essential to changing the world for the better. "At heart all of us are true scientists," he says. Thabit, an Intel ISEF 2012-2013 finalist and Intel STS 2014 finalist, spoke at TEDxDuke in 2016 about combating arsenic water poisoning with sustainably built water filters in Bangladesh, where he grew up. He started the iKomi NGO to do just this. Majoring in Environmental Sciences and Policy at Duke University, Thabit is the head coordinator of water filter operations at the Sabrina Memorial Foundation nonprofit in Bangladesh. He was also a Texan of the Year finalist in 2014, alongside Ted Cruz and George Bush. Nicole, an Intel ISEF 2014 and 2015 finalist, spoke at TEDxYouth@Granville in 2016. She developed a revolutionary, disposable early-stage HIV testing device. The device performs rapid diagnoses of HIV in adults before six to twelve weeks post-transmission and in infants under the age of 18 months. It can also find out if patients have strains of HIV resistant to certain drugs, and then predict which combination of drugs can work best to tackle the virus. Her device merged the fields of nucleic acid testing with microfluidic technology. "The problem isn't with treatment. Our weaknesses in our current approach are when it comes to diagnosis or identification of the disease and monitoring the disease," she says. Taylor, an Intel ISEF 2009-2012 finalist and TED talk veteran, spoke at TED in 2012. At 14, Taylor became the youngest person ever to produce nuclear fusion. He has since developed nuclear technologies, founded companies to commercialize his inventions, and runs several academic labs. Taylor is invested in figuring out (and being a part of) how the world will be powered in the future. "Kids can really change the world," he says. Amber, Intel ISEF 2016 second place winner and Regeneron STS 2017 finalist, spoke at TEDxJacksonville in 2016 about her novel techniques for tracking space debris. At 16, she developed an Artificial Neural Network system that tracks the orbits of space trash 10 times more effectively than current systems. "Society has a preconceived image of the person that should be a scientist," she says. "Six words — 'you can't because you're a girl' — made such an impact on my life and the lives of many other girls."